Today we would like to revisit one of the first projects in which KRION® left Spanish soil, and landed in the north of Europe, in Helsinki, Finland. Thanks to this type of project, we were able to present ourselves and reach our current position, carrying out the most ambitious solid surface projects in the world. 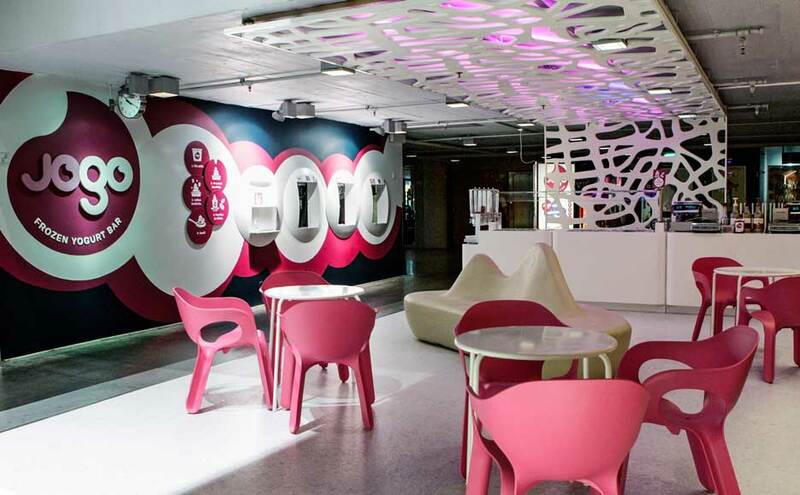 Jogo Frozen Yogurt Bar is part of the Jogo chain of bars specialising in frozen yoghurt. The space LAB studio was entrusted with the design and chose the compact mineral from PORCELANOSA Group, KRION®, as the main material for this facility. Architect Sonja Vasiljevic and designer Rosa Teuler Bou were able to create elegance in the establishment, combined with the sweet creaminess of frozen yoghurt. KRION® manipulated by L Surfaces, S.L.